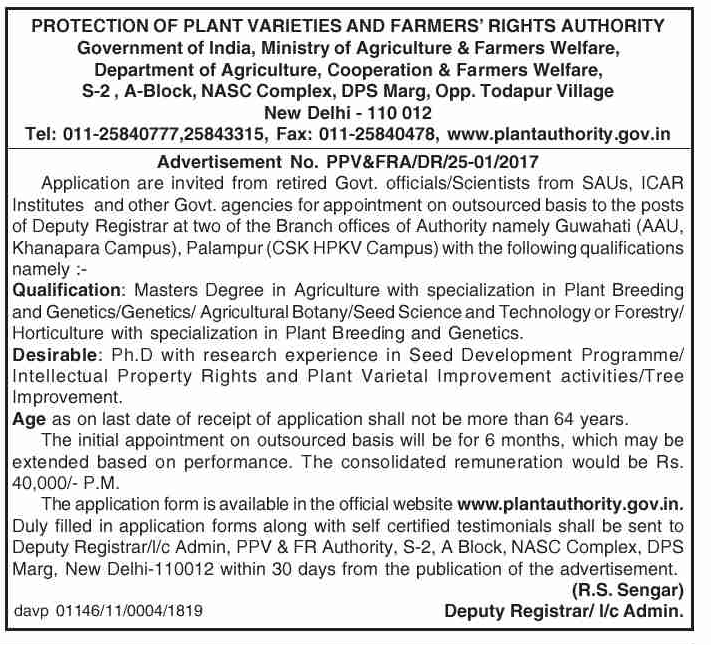 Protection of Plant Varieties & Farmers' Rights Authority, India. Educational Qualification: Masters Degree in Agriculture with specialization in Plant Breeding and Genetics/Genetics/ Agricultural Botany/Seed Science and Technology or Forestry/ Horticulture with specialization in Plant Breeding and Genetics. Desirable: Ph.D with research experience in Seed Development Programme/ Intellectual Property Rights and Plant Varietal Improvement activities/Tree Improvement. Age: Age as on last date of receipt of application shall not be more than 64 years. The initial appointment on outsourced basis will be for 6 months, which may be extended based on performance. Pay: The consolidated remuneration would be Rs. 40,000/- P.M.
How to apply: The application form is available in the official website www.plantauthority.gov.in. Duly filled in application forms along with self certified testimonials shall be sent to Deputy Registrar/i/c Admin, PPV & FR Authority. S-2, A Block. NASC Complex, DPS Marg, New Delhi-110012 within 30 days from the publication [17-01-2019] of the advertisement.